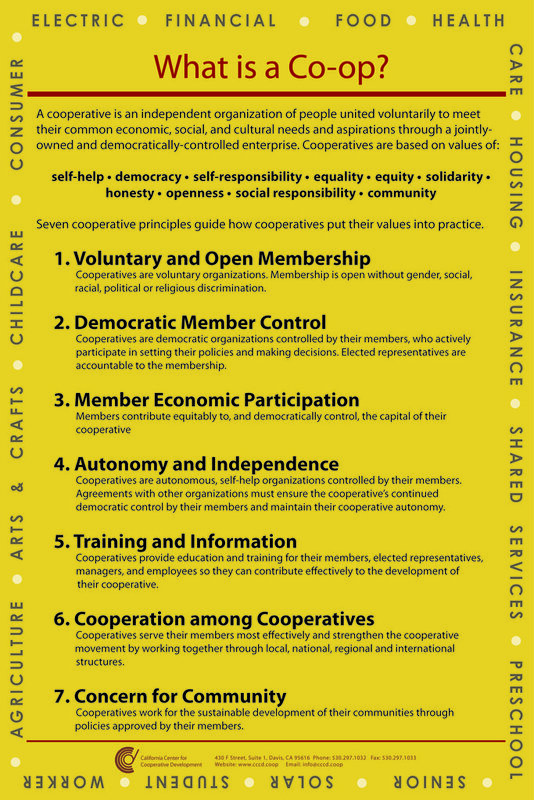 A cooperative is an organization that is owned and controlled by members, who use products, supplies and services. Cooperatives can vary in particular purpose, but share a common fact: Cooperatives are formed to meet specific member objectives, and adapt structurally to the changing needs of members. Self reliance and self-help are the hallmark of cooperatives. To find out more information about cooperatives, or have additional resources and contact information, click the link above. Click above to get access to material, and contact information. The co-op types include: Agricultural, Arts and Crafts, Business, Child Care and Preschool, Credit Unions, Food, Housing, Student, Utility, Worker. Learn more about the most recent stories. Additionally, if you have an interesting co-op story to share, please reach out and contact us.